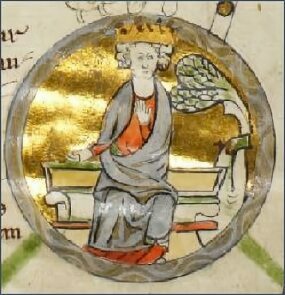 Edmund I, known as 'the Elder' or the Magnificent, was born circa 921, the son of King Edward the Elder and his third wife Edgiva. As a sixteen year old, he had fought with distinction beside his elder half-brother, King Athelstan, at the Battle of Brunanburh against a combined force of Scots and Vikings. Edmund was around eighteen when he succeeded Athelstan on England's throne in 940. The Danish leader, Olaf Guthrithson, took the city of York, supported by the infamous renegade Wulfstan, Archishop of York. Edmund besieged Olaf and Wulfstan at Leicester in 943. The King, supported by Odo, the Danish Archbishop of Canterbury, forced Olaf to accept his overlordship and agreement was eventually reached between the two opposing parties that Edmund was to rule the south and Olaf was to retain possession of all the area north of Watling Street. On the death of either, the survivor would inherit the whole country. Fortunately for Edmund, Olaf died the following year and the English King invaded Northumbria in 944. He marched a combined army of English and Welsh into Strathclyde, whose ruler, the renegade Donald or Dunmail had supported Olaf. Edmund conquered the province, which in 946 he ceded to Malcolm I, King of Scots on agreement that the latter should become his vassal. A peace treaty was signed between the two nations, ensuring mutual military support, Dunmail, the last Celtic King of Cumbria was killed in battle, his sons mutilated and Cumbria became a fiefdom of the recognised heir to the Scottish throne. Edmund married firstly to Ælfgifu of Shaftesbury and the couple produced three children, a daughter and two sons, Edwy and Edgar, who both succeeded to the English throne. After her death in around 944, Ælfgifu was canonized by the church. Edmund married for a second time in 946 to Æthelflæd of Damerham, a daughter of ealdorman Ælfgar, probably the ealdorman of Essex, but the marriage produced no children, after the death of her husband, leaving Æthelflæd as a wealthy widow. Records of Ely Cathedral, to which she, her sister, and her brother-in-law, were generous benefactors, record that she then married an ealdorman named Æthelstan. Edmund played a role in the restoration of King Louis IV to the French throne. 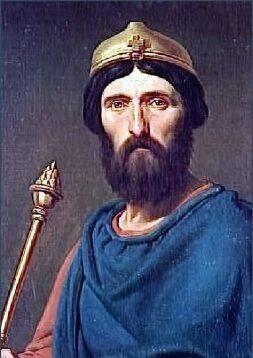 Louis, who was Edmund's nephew, the son of his half-sister Eadgifu and Charles the Simple of France, had stayed at his uncle's court for some time until 936, when he returned to be crowned King of France. Edmund's promising reign was cut violently short after only six years. On the Feast of St. Augustine, 26th May, 946, a great festival among the Anglo-Saxon peoples. During the course of revelries to celebrate the event at Pucklechurch, in Gloucester, Edmund, being none the better for the large amount of wine he had consumed, became angered at the presence of one Liofa, an outlaw whom he had expelled from the kingdom a few years previously. Angered beyond endurance at what he saw as an outrage against his authority, the King flung Liofa to the ground in fury and in the ensuing struggle the Edmund was fatally stabbed by the outlaw. Edmund the Elder was twenty-five years old when he was killed and was buried at Glastonbury Abbey in Somerset.